Share the post "Orthosiphon Aristatus Or Java Tea – Grow Herbal Remedy In Your Garden"
Orthosiphon aristatus, also known as Java Tea and Cat’s Whiskers is a medicinal herb traditionally used as remedies for various ailments in Southeast Asia and in Europe. The leaves of the plant are used on their own and also in combination with various other herbs. O. aristatus now appears in many commercial products in the forms of powdered herb, dried leaves, tea sachets, drinks, extracts, tablets and capsules. Java Tea is a perennial herb that grows in the wild, along forest fringes, but also on wastelands and along roadsides. It is native to tropical areas of Asia and has spread to the East Indies, Indochina and Indonesia, and cultivated in Java and Sumatra. Orthosiphon aristatus plant is pretty and unusual. The white flowers stand up high above the green leaves, and the plant can be seen from quite a distance away, despite its light, white flower color, especially in the evenings. The plant is grown for its medicinal properties and sometimes also as an ornamental. It is easily propagated by the cut stem, easily grow and need sunshine and water. Butterflies, bees and hummingbirds also find this plant very attractive. Common names: Cat’s Whiskers, Java Tea. Known as Kumis kucing in Indonesia and Misai kucing in Malaysia. Cultivars: Three cultivars of Orthosiphon aristatus are distinguished: one with bluish-violet and two with white flowers. The white-flowered cultivar with reddish stems, petioles and leaf veins appears to possess the best diuretic qualities. Plant type: Tropicals. Tender Perennial. Annual. Time to plant: Spring (seeds). Fall (cuttings). • It is better to propagate from softwood cuttings. Take 15 – 20cm long cuttings, which have some buds in the fall. Plant in shade directly into moist soil, with 40 – 60cm between plants and rows. Often 4 – 6 cuttings are placed in one hole. Direct planting in the field or in the backyard, as is most common, can be done all the year round, but the usual time of planting is at the beginning of the rainy season. For plant nurseries it is advised to use constant, liquid, complete fertilizer and heavy watering to grow cuttings to a “finished” 6″ pot. Research has confirmed the presence of a number of medically active compounds and also the diuretic action of the leaves. In the trade the drug is also known as “Indian kidney tea” or “Java tea”. Orthosiphon aristatus leaves is frequently used for the treatment of renal inflammation, kidney stones and dysuria. They are also used in the treatment of cystitis, urethritis and gout. It has been demonstrated that Java tea has anti-microbial properties. Aqueous extracts markedly inhibited the growth of both gram-positive and gram-negative bacteria. Orthosiphon leaves contain flavones (including sinensetin), saponins, a glycoside (orthosiphonin), an essential oil and large amounts of potassium (which is largely responsible for the diuretic effect). In Malaysia, the aerial part of O. aristatus is used for controlling high blood pressure, rheumatic fever, gout, arthritis, and diabetes. Decoction of the plant is also consumed in Malaysia to eliminate bladder and kidney stones. In Vietnam, the plant is used as a diuretic, as well as treatment for influenza, eruptive fever, rheumatism, hepatitis, jaundice, and biliary lithiasis. In Indonesia, the plant is used with a mixture of other herbs to treat jaundice, diabetes, gout, rheumatism, and arteriosclerosis. The Japanese, meanwhile, consume O. aristatus tea to facilitate body detoxification. In India, the leaves of O. aristatus are used as a diuretic in the treatment of nephrosis and severe oedema. The extract of O. aristatus is also a well-recognised traditional herbal medicinal product in a number of European countries, including Germany, France, Spain, and Poland. Europeans consume Java tea, an infusion of the dried leaves, for healthy urinary system, reduction of bacterial infection, and treatment of inflammatory diseases. Garden uses: Ornamental. Butterfly garden. Fertilizer: The livestock manure such as chicken dung can be used as the organic fertilizers for O. aristatus. The inorganic NPK fertilizer (10: 10: 10) can also be used to enhance growth of the plants. Edible: Yes (leaves), but be careful as the parts of the plant are poisonous. Only leaves are usually used in a tea. Toxicity: Parts of plant are poisonous if ingested. The crude herb is said to cause vomiting. 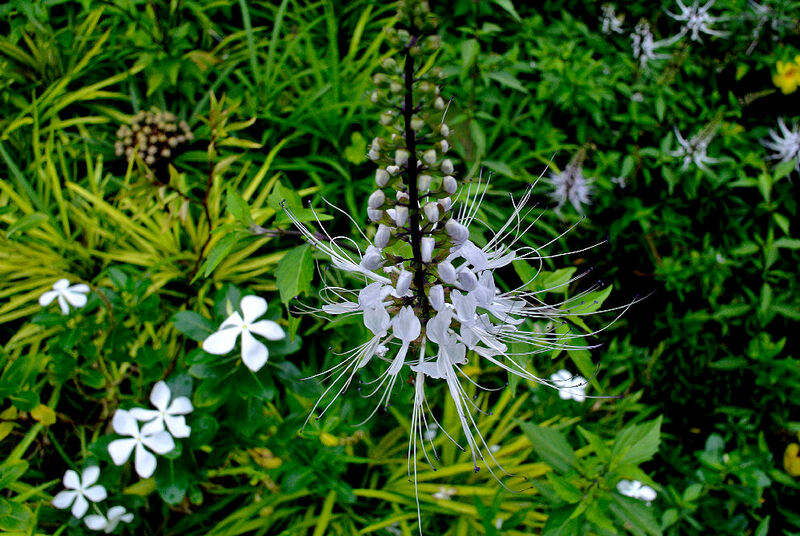 • Cat’s Whiskers is a fast growing plant that should do well in most gardens. It comes from a tropical climate, so replicating this environment with rich soil and good water supply will result in a healthy plant. • This plant does well in a damp garden corner with water loving plants. • Even when it is said that the plant requires full sun, this is not with the heat of Australian sunshine in mind. The plant will often wilt simply from the heat, so it is worth trying part shade or a few different places to see where it grows best. Some shelter from the extremes of winter is also recommended in cooler regions. • This plant is quite hardy and also grows well in temperate conditions, but letting the ground dry out may result in the plant dying even when watering resumes. It may be semi-deciduous in cold winters with the leaves turning yellow and becoming sparse. Frost may kill the plant unless it is well protected. • In areas where the plant dies down completely it should grow back if allowed to self seed and grow as an annual. Many home gardeners report that cutting back flower stalks leads to improved performance the following year. Do you grow Orthosiphon Aristatus (Cat’s Whiskers or Java Tea) in your garden? What is your experience with this plant? Please share with other fellow gardeners in the comments below! Do you sell Orthosiphon Aristatus (Cat’s Whiskers or Java Tea) seeds or have plants for sale? You can place your advertisement here. Contact us now!